A furnace is equipment which is used as a reactor, or for melting of metals for casting, or to heat materials to change their shape (e.g. rolling, forging etc.) or properties (heat treatment). Industrial furnaces are mainly used for carrying out the process or for the purpose of heating. Furnaces which are used for carrying out the processes are sometimes known as reactors. Industrial furnaces which do not ‘show colour’, that is, in which the temperature is below 650 deg C are sometimes called ‘ovens’. However, the dividing line between ovens and furnaces is not very sharp. As an example, coke ovens operate at temperatures above 1400 deg C. In the ceramic industry, furnaces are called ‘kilns’. In the petrochemical and chemical process industries, furnaces are termed ‘heaters’, ‘kilns’, ‘afterburners’, ‘incinerators’, or ‘destructors’. The furnace of a boiler is known as its ‘firebox’ or ‘combustion chamber. Industrial heating furnaces are insulated enclosures designed to deliver heat to loads for many forms of heat processing. Furnaces used as reactors, and melting furnaces require very high temperatures and can involve erosive and corrosive conditions. Shaping operations need high temperatures to soften materials for processes such as forging, swaging, rolling, pressing, bending, and extruding etc. Heat treating operations need midrange temperatures to physically change crystalline structures or chemically (metallurgically) alter surface compounds, including hardening or relieving strains in metals, or modifying their ductility. These include aging, annealing, normalizing, tempering, austenitizing, carburizing, hardening, malleabilizing, nitriding, sintering, spheroidizing, and stress relieving etc. Industrial processes which use low temperatures include drying, coating, polymerizing, and chemical changes etc. Industrial heating operations encompass a wide range of temperatures, which depend partly on the material being heated and partly on the purpose of the heating process and subsequent operations. In any heating process, the maximum furnace temperature always exceeds the temperature to which the load or charge is to be heated. Furnaces use either fuel or electricity as energy input needed for the purpose of heating. Furnaces are to ideally heat as much of material as possible to a uniform temperature with the least possible fuel and labour. The key to efficient furnace operation lies in complete combustion of fuel with minimum of excess air. To achieve this end, the following parameters are to be considered. Determination of the quantity of heat to be imparted to the material or charge. Liberation of sufficient heat within the furnace to heat the stock and overcome all heat losses. Transfer of available part of that heat from the furnace gases to the surface of the heating stock. Equalization of the temperature within the stock. Reduction of heat losses from the furnace to the minimum possible extent. All the furnaces have the following components. Refractory chamber constructed of insulating materials to retain heat at high operating temperatures. Hearth to support or carry the load for heating, which consists of refractory materials supported by a steel structure, part of which can be water-cooled. Burners that use liquid or gaseous fuels to raise and maintain the temperature in the chamber. Solid, liquid or gaseous fuel or electricity can also be used in the industrial heating furnaces. Charging and discharging doors through which the chamber is loaded and unloaded. Loading and unloading equipments which may include roller tables, conveyors, charging and discharging machines etc. The load or charge in a furnace or heating chamber is surrounded by sidewalls, hearth, and roof consisting of a heat-resisting refractory lining, insulation, and a gas-tight steel casing. All are supported by a steel structure. In continuous furnaces, cast or wrought heat-resisting alloy steels are used for skids, hearth plates, walking beam structures, roller, and chain conveyors. In many furnaces, the loads to be heated, rest on the hearth, on piers to space them above the hearth, or on skids or a conveyor to enable movement through the furnace. To protect the foundation and to prevent softening of the hearth, open spaces are frequently provided under the hearth for air circulation (a ventilated hearth). Fuel and air enter a furnace through burners that fire through refractory tiles or quarls which are the refractory-lined holes or ‘ports’ through a combustion chamber wall, through which air and fuel are injected and/or a burner flame is fired. Burners are normally designed to enhance the flame stability by adding the minimum ignition energy required to begin and sustain chemical reactions. The burners can influence the flame stability and character. The inside passage of a burner can be cylindrical or conical, diverging or converging. The products of combustion (usually assumed stoichiometric or lean combustion) contain CO2, H2O, N2, and O2 unless there is incomplete combustion. Products of combustion are usually wet and contain water vapour. They also can contain excess air, tramp air, excess unburned fuel, or a variety of products of incomplete combustion. The product of combustion circulate over the inside surfaces of the walls, ceiling, hearth, piers, and loads, heating all by radiation and convection. They leave the furnace flues to stacks. The condition of furnace interior, the status of the loads, and the performance of the combustion system can be observed through air-tight peepholes or sight ports which that be closed tightly. In modern practice, hearth life is frequently extended by burying skids made of heat resistant steels to support the loads. The skids transmit the weight of the load around 0.1 m into the hearth refractories. At that depth, the refractories are not subjected to the hot furnace gases that, over time, soften the hearth surface refractories. The grades of heat resistant steel used for this service usually contain high chromium (Cr) and nickel (Ni) for near-maximum strength and low corrosion rates at hearth temperatures. Fireclay and alumina bricks are the dominant material used in furnace construction. These bricks are available in many compositions and shapes for a wide range of applications and to meet varying temperature and usage requirements. High-density, double-burned, and super-duty (low-silica) bricks have high temperature heat resistance, but relatively high heat loss and hence they are normally backed by a lower density insulating bricks (bricks with small, bubble like air spaces). furnace refractory bricks serve the multiple purposes of providing load-bearing walls, heat resistance, and containment. These days, structural steel framing and steel plate casings are more common and the furnaces are built with externally suspended roofs, minimizing the need for load-bearing refractory walls. Heat is generated in furnaces to raise their temperature to a level somewhat above the temperature needed for the process, either by (i) combustion of a fuel or by (ii) conversion of electric energy to heat.Fuel-fired (combustion type) furnaces are most widely used, but electrically heated furnaces are used where they offer advantages which cannot be always measured in terms of fuel cost. In fuel fired furnaces, the nature of the fuel may make a difference in the furnace design, but that is not much of a problem with modern industrial heating furnaces and burners, except if solid fuels are involved. Similar bases for classification are air furnaces, oxygen furnaces, and atmosphere furnaces. Related bases for classification might be the position in the furnace where combustion begins, and the means for directing the products of combustion, e.g., internal fan furnaces, high velocity furnaces, and baffled furnaces. Electric furnaces for industrial process heating may use resistance or induction heating. Theoretically, if there is no gas or air exhaust, electric heating has no flue gas loss, but it is to be recognized that the higher cost of electricity as a fuel is the result of the flue gas loss from the boiler furnace at the power plant which generates the electricity. Resistance heating normally involves the highest electricity costs, and can need circulating fans to assure the temperature uniformity usually achievable by the flow motion of the products of combustion in a fuel-fired furnace. Silicon (Si) control rectifiers have made input modulation more economical with resistance heating. Various materials are used for electric furnace resistors. The common material which is used is Ni-Cr alloy, in the form of rolled strip or wire, or of cast zigzag grids (mostly for convection). Other resistor materials are molten glass, granular carbon, solid carbon, graphite, or silicon carbide. It is occasionally possible to use the load that is being heated as a resistor. In induction heating, a current passes through a coil that surrounds the piece to be heated. The electric current frequency to be used depends on the mass of the piece being heated. The induction coils are generally water cooled to protect them from overheating themselves. Although induction heating ordinarily uses less electricity than resistance heating, some of the gain is lost due to the cost of the cooling water and the heat that it carries with it. Induction heating can be easily adapted to heating only the localized areas of each piece and to mass-production methods. However these day, modern production techniques with rapid impingement heating using gas flames have been very successfully employed in hardening of gear teeth, heating of flat springs for vehicles, and a few other high production applications. More recent developments in processing by new methods of electric or electronic industrial heating include use of plasma arcs, lasers, radio frequency, microwave, and electromagnetic heating, and combinations of these with fuel firing. In this classification industrial heating furnaces are identified for the purpose for which they are being used. Examples are soaking pits and reheating furnaces for the heating of ingots, blooms or billets in the rolling mills, forging furnaces for the heating of whole pieces or ends of bars for forging or welding. Slot forge furnaces have a horizontal slot instead of a door for inserting the many bars that are to be heated at one time. The slot also often serves as the flue. Industrial heating furnaces also sometimes named for the material being heated. Examples are bolt heading furnaces, plate furnaces, wire furnaces, rivet furnaces, and sheet furnaces etc. Some furnaces also are classified by the process of which they are a part, such as hardening, tempering, annealing, melting, and polymerizing. In carburizing furnaces, the load to be case-hardened is packed in a carbon-rich powder and heated in pots/boxes, or heated in rotating drums in a carburizing atmosphere. If the flames developed in the heating chamber are proper, or if the products of combustion are circulated over the surface of the material to be heated, the furnace is said to be direct-fired. In most of the furnaces, ovens, and dryers, the loads are not to be harmed by contact with the products of combustion. Indirect-fired furnaces are used for heating materials and products for which the quality of the finished products can become inferior if they come in contact with flame or products of combustion. In such cases, the material to be heated can be either (i) heated in an enclosed muffle (conducting container) that is heated from the outside by products of combustion from burners or (ii) heated by radiant tubes that enclose the flame and product of combustion. In case of a muffle furnace the muffle can be made of high temperature resistant alloy steel or ceramic. It is usually pumped full of an inert gas. Pot furnace or crucible furnace are a form of muffle furnace in which the container prevents product of combustion to come in contact with the load. In crucible or pot furnace, tangentially fired integral regenerator-burners save fuel, and their alternate firing from positions 180 deg apart provides even heating around the pot or crucible periphery. In a double muffle arrangement, not only is the charge is enclosed in a muffle but the products of combustion are also confined inside muffles which are called radiant tubes. This use of radiant tubes to protect the inner cover from uneven heating is being replaced by direct-fired flat and high velocity flames to heat the inner cover, thereby improving thermal conversion efficiency and reducing heating time. In case of radiant tube furnaces, for charges which need a special atmosphere for protection of the material to be heated from oxidation, decarburization, or for other purposes, modern indirect fired furnaces are built with a gas tight outer casing surrounding the refractory lining so that the whole furnace can be filled with a prepared atmosphere. Heat is supplied by fuel-fired radiant tubes or electric resistance elements. 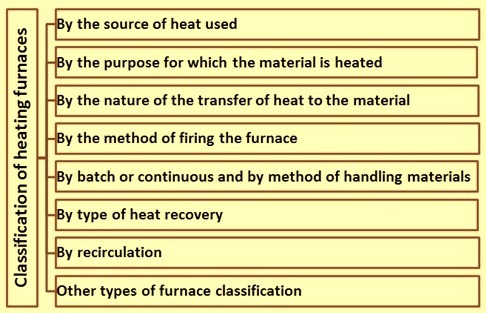 This classification applies principally to the oven type of furnace, and it indicates whether the furnace is direct-fired, over-fired, under-fired, or heated by radiant tubes. The direct-fired method finds increased utilization with constant improvement in the design and control of gas and oil burners, especially for temperatures above 650 deg C. In over-fired furnaces, radiant burners fire through the roof and are arranged in patterns to obtain the best temperature distribution. The under-fired furnace is excellent for temperatures between 400 deg C to 1,000 deg C because the heated product is protected from the burning fuel. The temperature and atmosphere can be closely controlled, but the temperature is limited by the life of the refractories to about 1,000 deg C. Many furnaces are now designed with the use of special protective atmospheres and involve the use of radiant tubes to avoid any contact with the combustion gases. These fuel fired tubes of heat resistant alloy steels can be horizontal across the furnace above and below the heated material or may be vertical on the sidewalls of the furnace. Batch type furnaces and kilns, also termed as ‘in-and-out furnaces’ or ‘periodic kilns’ have one temperature set point, but via three zones of control in order to maintain uniform temperature throughout, because of a need for more heat at a door or the ends. They may be loaded manually or by a manipulator or a robot. Loads are placed in the furnace and the furnace and it loads are brought up to temperature together, and depending on the process. The furnace may or may not be cooled before it is opened and the load is removed usually through a single charging and discharging door. Batch furnace configurations include box, slot, car-hearth, shuttle, bell, elevator, and bath (including immersion). For long solid loads, crosswise piers and top-left/bottom-right burner locations circulate for better uniformity. Bell and elevator kilns are often cylindrical. Furnaces for pot, kettle, and dip-tank containers may be fired tangentially with high velocity low swirl flames instead of flat, high swirl flames. Unlike crucible, pot, kettle, and dip-tank furnaces, the furnace refractory lining itself is the ‘container’ for glass ‘tanks’ and aluminum melting furnaces. Car hearth furnaces have a movable hearth with steel wheels on rails. The load is placed on the car hearth, moved into and heated in the furnace and removed from the furnace on the car hearth. The car hearth is then unloaded. Cooling is done on the car hearth either in the furnace or outside before unloading. This type of furnace is used mainly for heating heavy or bulky loads, or short runs of assorted sizes and shapes. The furnace door can be affixed to the car. However, a guillotine door (perhaps angled slightly from vertical to let gravity help seal leaks all around the door jamb) usually keeps tighter furnace seals at both door-end and back end. Sealing the sides of a car hearth or of disc or ring shaped hearths of rotary hearth furnaces is usually accomplished with sand-seals or water-trough seals. Continuous furnaces move the charged material while it is being heated. Material passes either over a stationary hearth, or the hearth itself moves. If the hearth is stationary, the material is pushed or pulled over skids or rolls, or is moved through the furnace by woven wire belts or mechanical pushers. Except for delays, a continuous furnace operates at a constant heat input rate, burners being rarely shut off. A constantly moving (or frequently moving) conveyor or hearth eliminates the need to cool and reheat the furnace (as is the case with a batch furnace), thus saving energy. Horizontal straight-line continuous furnaces are more common than rotary hearth furnaces, rotary drum furnaces, vertical shaft furnaces, or fluidized bed furnaces. Side discharge using a peel bar pushing mechanism permits a smaller opening than the end (gravity dropout) discharge. The small opening of the side discharge reduces heat loss and minimizes uneven cooling of the next load piece to be discharged. Other forms of straight-line continuous furnaces are woven alloy wire belt conveyor furnaces used for heat treating metals, roller hearth furnaces and tunnel furnaces/tunnel kilns. Alternatives to straight-line horizontal continuous furnaces are rotary hearth (disc or ring shaped) furnaces, inclined rotary drum furnaces, tower furnaces, shaft furnaces, fluidized bed furnaces, and liquid heaters and boilers. Rotary hearth or rotating table furnaces are very useful. Loads are placed on the merry-go-round-like hearth, and later removed after they have completed almost a whole revolution. The rotary hearth, disc or ring shaped (with a hole in the middle), travels on a circular track. The rotary hearth or rotating table furnace is especially useful for cylindrical loads, which cannot be pushed through a furnace, and for shorter pieces that can be stood on end or laid end to end. The central column of the ring shaped type furnace helps to separate the control zones. Multi hearth furnaces are a variation of the rotary hearth furnace with many levels of round stationary hearths with rotating rabble arms which gradually plow granular or small lump materials radially across the hearths, causing them to eventually drop through ports to the next level. Inclined rotary drum furnaces, kilns, incinerators, and dryers frequently use long luminous flames. If drying is involved, then considerably more excess air than normal is justified to provide greater moisture pickup ability. Tower furnaces conserve floor space by running long strip or strand materials vertically on tall furnaces for drying, coating, curing, or heat treating (especially annealing). In some cases, the load is protected by a special atmosphere, and heated with radiant tubes or by electrical means. Shaft furnaces are generally refractory lined vertical cylinders, in which gravity conveys solids and liquids to the bottom and by-product gases to the top. Examples are cupolas, blast furnaces, and lime kilns. Fluidized bed furnaces utilize intense gas convection heat transfer and physical bombardment of solid heat receiver surfaces with millions of rapidly vibrating hot solid particles. The furnaces take following forms. A refractory lined container, with a fine grate bottom, filled with inert (usually refractory) balls, pellets, or granules which are heated by products of combustion from a combustion chamber below the grate. Loads or boiler tubes are immersed in the fluidized bed above the grate for heat processing or to generate steam. Similar to above, but the granules are fuel particles or sewage sludge to be incinerated. The space below the grate is a pressurized air supply plenum. The fuel particles are ignited above the grate and burn in fluidized suspension while physically bombarding the water walls of the upper chamber and water tubes immersed in its fluidized bed. The fluidized bed is filled with cold granules of a coating material (e.g., polymer), and loads to be coated are heated in a separate oven to a temperature above the melting point of the granules. The hot loads (e.g., dishwasher racks) are then dipped (by a conveyor) into the open-topped fluidized bed for coating. Most heat recovery efforts are aimed at utilizing the waste heat exiting through the flues. Some forms of heat recovery are air preheating, fuel preheating, load preheating, recuperative, regenerative, and waste heat boilers. Preheating combustion air is accomplished by recuperators or regenerators. Recuperators are steady-state heat exchangers which transmit heat from hot flue gases to cold combustion air. Regenerators are non-steady state devices which temporarily store heat from the flue gas in many small masses of refractory or metal, each having considerable heat-absorbing surface. Then, the heat absorbing masses are moved into an incoming cold combustion air stream to give it their stored heat. Furnaces equipped with these devices are sometimes termed recuperative furnaces or regenerative furnaces. Regenerative furnaces in the past have been very large, integrated refractory structures incorporating both a furnace and a checker work refractory regenerator, the latter frequently much larger than the furnace portion. Except for large glass melting tanks, most regeneration is now accomplished with integral regenerator/burner packages which are used in pairs. Boilers and low temperature applications sometimes use a ‘heat wheel’ regenerator which is a massive cylindrical metal latticework that slowly rotates through a side-by-side hot flue gas duct and a cold combustion air duct. Both preheating the load and preheating combustion air are used together in steam generators, rotary drum calciners, metal heating furnaces, and tunnel kilns for firing ceramics. For medium or low temperature furnaces/ovens/dryers operating below around 750 deg C, a forced recirculation furnace or recirculating oven delivers better temperature uniformity and better fuel economy. The recirculation can be by a fan and duct arrangement, by ceiling plug fans, or by the jet momentum of burners. These furnaces require thoughtful circulation design and careful positioning of burners relative to the loads. There are stationary furnaces, portable furnaces, and furnaces which are slowly rolled over a long row of loads. Many kinds of continuous ‘conveyor furnaces’ have the stock carried through the heating chamber by a conveying mechanism. Other forms of conveyors are wire-mesh belts, rollers, rocker bars, and self-conveying catenary strips or strands. In porcelain enameling furnaces and paint drying ovens, contact of the loads with anything that might damage their surfaces is avoided by using hooks from an overhead chain conveyor. For better furnace efficiency and for best chain, belt, or conveyor life, they should return within the hot chamber or insulated space. ‘Oxygen furnace’ was an interim name given to any furnace which used oxygen-enriched air or near-pure oxygen. In many high-temperature furnaces, productivity can be increased with minimum capital investment by using oxygen enrichment or 100 % oxygen (oxy-fuel firing). Either method reduces the nitrogen concentration, lowering the percentage of diatomic molecules and increasing the percentage of triatomic molecules. This raises the heat transfer rate (for the same average gas blanket temperature and thickness) and thereby lowers the stack loss. Oxygen use reduces the concentration of nitrogen in a furnace atmosphere (by reducing the volume of combustion air needed), so it can reduce NOx emissions. Such oxygen uses have become a common feature to many types of furnaces, which are better classified by other means.